The Cassini spacecraft has imaged propeller-shaped features in Saturn's rings. 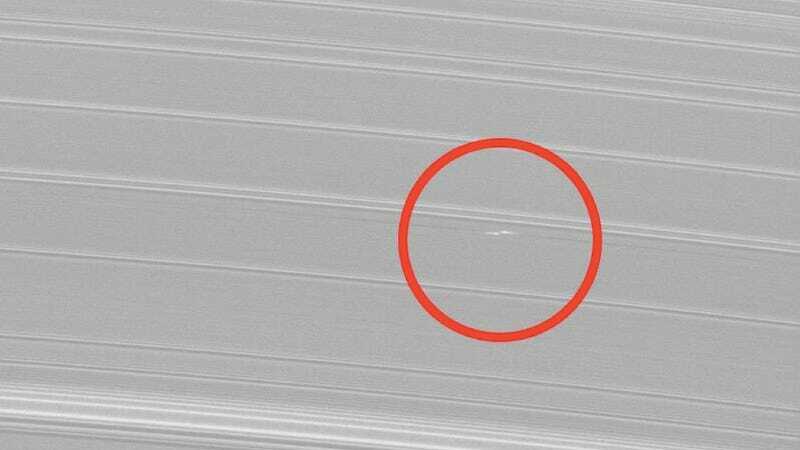 They are created by tiny moons in Saturn's rings perturbing the ring particles. The two-bladed propeller-shaped feature near the bottom of image reveals the location of a tiny moonlet embedded in Saturn's A ring. The feature is a result of the gravity of this moon affecting the orbits of nearby ring particles. The propeller has been nicknamed "Bleriot" by the imaging scientists, after the French aviator who first flew the English Channel in 1909. The image was obtained at a distance of approximately 349,000 miles (561,000 kilometers) from Saturn and at a Sun-Saturn-spacecraft, or phase, angle of 41 degrees. Image scale is 2 miles (3 kilometers) per pixel. The moonlet itself is only about half a mile wide, making it invisible at this distance and resolution. Its presence is only made known through its effect on the particles around it. It is one of a growing number of "propeller" moons that have been observed over the past several years. This latest one is larger than the others and has cleared ring material from the dark wing-like regions to its left and right in these images. Disturbed ring material closer to the moon reflects sunlight brightly, creating the white, propeller-like shape. The propeller structure is about 3 miles, in the radial dimension (the dimension moving outward from Saturn), while the dark wings appear to be about 700 miles wide in the longitudinal direction. The complex dynamics occurring within the rings offers scientists an insight into what went on in the early formation of the solar system, as the planets coalesced from a similar—-though infinitely larger—-ring around the sun. You can see the propeller in motion here.